Join the discussion on our forums! Come discuss Blackguard over in our dedicated Blackguard discussion topic. If there is ever a way to give a minion lifesteal, I'm pretty sure this card + that would instantly win you the game. A really cool and well designed card. Nice synergy with control paladin tools. Using this with Truesilver Champion and then attacking a 2hp minion will cancel the truesilver attack if the blackguard hits the minion you're attacking. You won't lose a weapon charge but you still get healed and you can attack again! Blackguard is sick. 9 health generally sticks, especially with higher priority removal targets. That allows you to gain some clears through healing (Ivory Knight, Truesilver into multi-heals), or just Steed it up to 15 health. Blackguard is just too good if your opponent doesn't address this immediately it can spiral out of control. 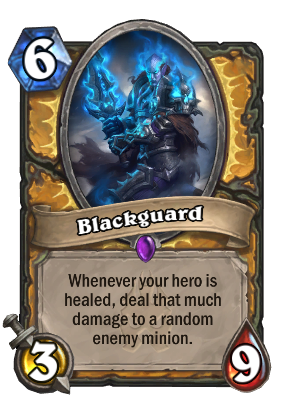 If you run DK Uther this is a must have, you should also add a forbidden healing, maybe even 2 (I only run 1 and 1 lay on hands). Along with true silver you can deal 6 damage to a single minion. Not counting the blackguard. I think this is the golden card for pally this expansion. The best Shadow Word: Pain target in the game. I'd say Al'Akir the Windlord is also a pretty solid Shadow Word: Pain target! Nah, nobody plays him and even if they do he either kills you on that turn, kills himself by trading into minions, or trades and leaves a body without divine shield and low health. But this guy on turn 6 feels like Ancient of War, hard to deal with outside of hard removal. You should check out this card's flavor text. I already have but I think the flavor text wasn't yet available when I posted that. Definitely something is there, intresting effect, great with lifsteal. 4 mana body ok... is the special effect worth 2 extra? probably not only wickerflame, forbiden healing, light lord and the deathknight weapon would work with it. It's going to be hard to set this up with a wickerflame attack and hard to set up with lightlord so realisticly it'll work best with forbiden healing but then you have to use forbiden healing to heal at most 8 and the hero I think isn't that hot and WAY late game.